Last school year, I taught a class for district staff titled “Becoming a Connected Educator”. The course’s foundational text was The Connection Educator: Learning and Leading in the Digital Age (Solution Tree, 2011) by Sheryl Nussbaum-Beach and Lani Ritter Hall. We explored many digital tools that could augment the strong instructional practice in their classrooms. While I felt our time was well spent, I thought there could have been a stronger teacher perspective. As a principal, my position limited my ability to teach what a connected classroom looked and sounded like. 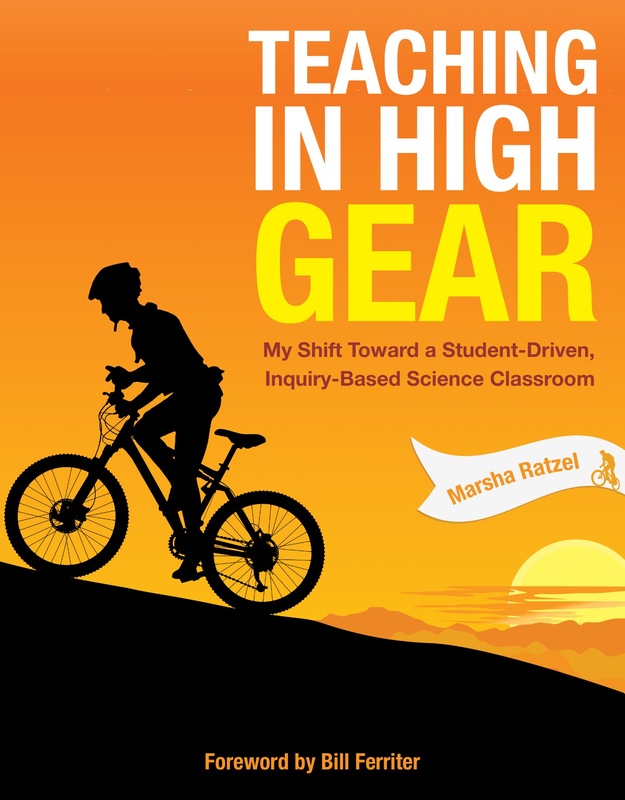 That is why I wish Marsha Ratzel would have written her book Teaching in High Gear: My Shift Toward a Student-Driven, Inquiry-Based Science Classroom (Powerful Learning Press, 2013) a year earlier. I would have referred to it often! Like her colleague Kathy Cassidy’s book Connected from the Start: Global Learning in the Primary Grades (Powerful Learning Press, 2012), Marsha provides that point of view that you cannot get from many other educational resources. She shares both her successes and failures, even though they are both categorized as “learning opportunities” in her classroom. Marsha doesn’t gloss over the growing pains she experienced as she helped her students become more connected. She recognizes that this work is hard even though it is worth it. As she integrated digital tools into her instruction, she also did not lose focus on the powerful practices that guide her students toward deep understanding. Excellent teaching is not so much something we achieve as something we pursue. It’s like mountain biking, another passion of mine. Heading toward the mountaintop helps me focus, but the greatest joy comes in the pedaling and enjoying the ride (p 10). Having a professional-personal life balance allows Marsha to see connections between the two she otherwise might not have. This past school year I experimented with teaching science through the lens of current events. That worked out very well — it allowed me to cover every single one of my science objectives and also overlap with my grade-level colleagues on tons of interdisciplinary skills that I know are critical to our students’ long-term success (p 14). Marsha appears to have that unique skill to see beyond her own students and classroom. She intentionally incorporates other disciplines and meaningful content in her instruction. Not only do her grade-level colleagues benefit from her collaborative nature, but so do her students. Marsha sees the advantage of partnering with students as she plans for instruction, all while still being accountable for their learning. Let me be clear. I’m still in charge of my room. I bring the expertise about curriculum, lesson design and assessment. But I had become convinced that in order to create passion around learning, students had to become my partners in what we were studying. In more than 20 years of teaching, I don’t think I’d ever been to any kind of professional development where they talked about this. I knew I’d never had a college or graduate class about this kind of learning philosophy (p 17). Marsha also recognizes that the learning targets, whether that be in her algebra or science class, can connect with broader concepts. This practice allows her students to develop enduring understandings of what is important to their lives, and life in general. Check out her reflections during her attempt to use a “Big Themes” framework with her 8th graders in science class. Finding mega-themes where you can add onto knowledge as you revisit will help students learn material faster. If you give them a framework where they can hook new learning onto what they already understand, it isn’t like starting from zero each time (p 49). Teaching conceptually relates the big idea to specific instances, thus compacting the amount of time it takes to teach those specific instances. Think about a multi-tool — a power tool with interchangeable parts (p 50). I realized during this experience that empowering my students required a partnership where WE had to the design the path based on their vision and then travel that path together (p 53). Students “won” because they had choice and could direct their learning toward things that interested them. I “won” because student involvement was rising and we were co-designing the learning activities. The school “won” because we covered all the science curriculum and additional topics in related subject areas (p 53). I particularly liked this line. It reveals her gift to think beyond the now, to put herself in others’ shoes. Her value reaches throughout her school because of this ability to take multiple perspectives. Everyone benefits. I am a believer in ‘intentional serendipity’ so I try to set up environments that are transparent – where kids’ characteristics, passions, strengths, quirks and ‘weaknesses’ are explicit. I have kids use shared creation spaces that I require the other students to visit and comment – so that each will know about all (p 70). Marsha allows connections beyond her classroom walls through social media such as Twitter, her classroom blog, and Google. Readers get a first hand view of this interaction, as many of her tweets and posts are embedded in the digital texts. These shared learning exchanges provides the model that helps lead Marsha’s class to allow their thinking to be visible. The interactions she fosters in digital spaces lead to learning opportunities that even she cannot anticipate. Giving students that space to explore allows Marsha to be a co-learner and coach in her classroom. Seeing this transformation as she becomes more than just your traditional teacher is inspiring. In Teaching in High Gear, you get to witness first hand the evolution of an educator who decides to create a learning environment that works for all students. Her classroom moves beyond the four walls in her school. Her students become co-creators and deliverers of the content. Her parents and personal learning network get first hand access to their progress and performance thanks to the power of social media. Her school now has a model of a 21st century educator. Just as important, Marsha discovers a powerful life lesson about this process of becoming an inquiry-based, student-driven educator. My students’ strength meant they were willing to dig down deep when what they really wanted was to quit. Some people never learn that finding the answer or doing something successful is mostly overcoming fear that it can’t be done (p 95). In the future, students who have Mrs. Ratzel as their teacher will reap the benefits of her courage to become better. This book provides a clear pathway for any educator to follow the trail she has blazed. Ok, OK, enthusiastic and loved the teachers voice in the written format! always leave out students who have English as a second language and English as a foreign language! Thanks for commenting Laurie. You also read this book? Thanks Matt, I really did have the priviledge of working with amazing people…the idea of intentional serendipity was something that a PLN colleague taught me (Peter Skillen) and I learned to let go from another PLN colleague (Sheryl Neussbaum) and the coaching I learned from yet another virtual colleague (Lani Hall). 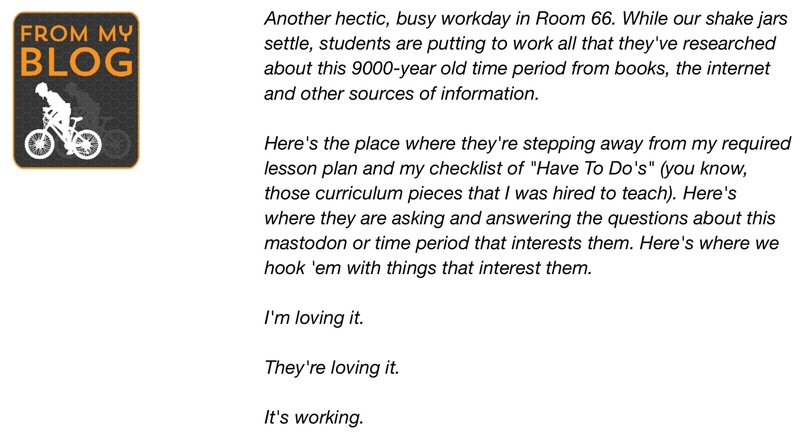 I couldn’t have written this without another PLN buddy…John Norton. What I feel was the gift that this book gave me was realizing that I am the beneficiary of the collective wisdom of many. And then I have students that are willing to try something new…..how would it ever get better than this??? And now you’ve written this supportive review. I am a blessed person. Thanks for your kind words…they really inspire me to keep on trying and pushing myself to learn more, try more and never stop being a lifelong learner. You are welcome, Marsha. I hope others will find your book as insightful and relevant as I did.